My be it's the color, may be it's hight fat content. Or the fact you don't have to deal with a lot of little bones! Whatever the reason, salmon - either fresh or smoked- has long been one of America's favorite fish. 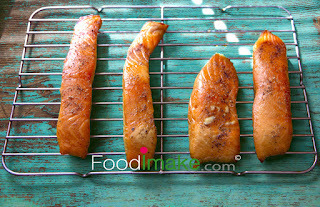 Add to this the penchant of modern American chefs for finding creative ways with salmon (both fresh and smoked). Within the variety of Salmon you find at the fish market and stores now!! The first question you may ask, what salmon should I buy? 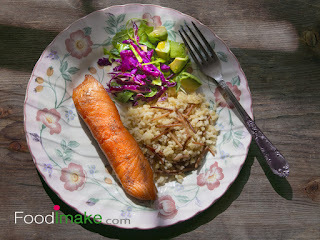 I've found the answer like other chefs heard and agreed, that wild salmon has more flavor and better texture than farm-raised salmon, and fortunately recently we start seeing wild salmon, at some of the retail markets. However the salmon you will find in the retail markets mow, is mostly farm-raised, the good news is that the quality of this product is uniformly acceptable. There is tow type of smoked salmon, cold - smoked called Nova or Scotch, comes as silky translucent thin sliced, and the hot-smoked which's the fillet flaky firm textures. 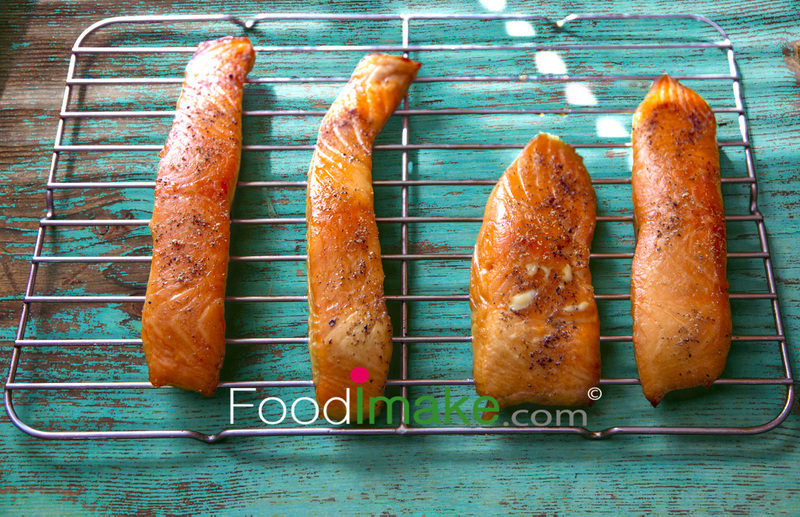 Cold-smoked salmon, is usually smoked on lower temperature around 80F for 4 - 6 hours and consumed clod. However the hot - smoked salmon, which our recipe included today, is smoked at higher temperature around 150 - 180F for 2 to 2 1/2 hrs. This salmon could be consumed cold or warm ( I like it cold), I intended to keep the salmon flavor by not adding too many spices, So I used small amount of black pepper only! Cure and rub the salmon in the sugar and salt, and keep it at the fridge for 6 - 8 hors, till you see they lost big part of there liquid. Take it out and rinse and wash the salmon in cold water. Dry each piece in paper towel, add some pepper as you like, and place it on a rack ready to smoke. Place few brackets or charcoal lumps in the corner of the grill, and let the heat rise till 150F and not exceeding 180.